In a shocking development that can’t possibly end well, the Army Corps of Engineers will be evicting everyone from Corps-managed land north of the Cannonball River on December 5 — just one day after a delegation of veterans plans to arrive to defend Standing Rock Sioux water protectors and their supporters opposing construction of the Dakota Access Pipeline. Although the Corps so graciously established what is laughably termed a “free speech zone” south of the Cannonball River, the letter makes undeniable the fact it plans to evict everyone from the camps already in place. 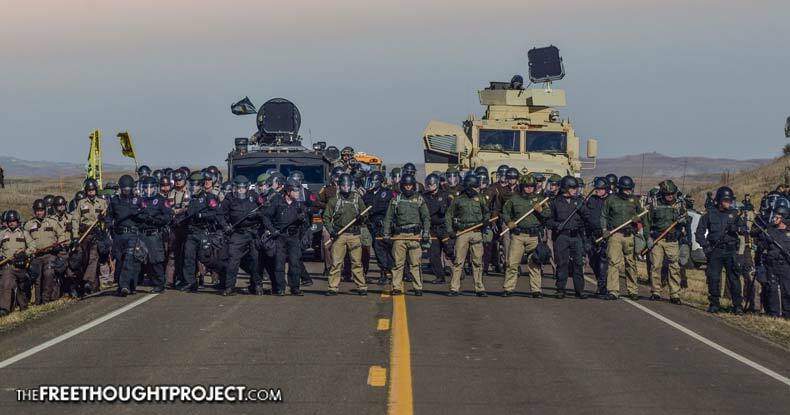 However, the Army Corps of Engineers flagrantly ignores it has been the actions of the Morton County Sheriff’s Department and hundreds of officers from at least five states which have continually endangered water protectors by escalating violence whenever possible. Were the Corps not clearly motivated to protect only Energy Transfer Partners — the company responsible for construction of the pipeline — over the rights of Native Americans who have been exploited in the matter, Henderson would be sending a letter to law enforcement stating police actions have crossed the line are risking literal life and limb. That concern, given the circumstances, is little more than a hollow token — obligatory before a wildly unpopular decision has been made that will affect the lives of thousands at the camps. “Today we were notified by the U.S. Army Corps of Engineers that on Dec. 5th, they will close all lands north of the Cannonball River, which is where Oceti Sakowin camp is located. The letter states that the lands will be closed to public access for safety concerns, and that they will allow for a ‘free speech zone’ south of the Cannonball River on Army Corps lands. “Our Tribe is deeply disappointed in this decision by the United States, but our resolve to protect our water is stronger than ever. We ask that all everyone who can appeal to President Obama and the Army Corps of Engineers to consider the future of our people and rescind all permits and deny the easement to cross the Missouri River just north of our Reservation and straight through our treaty lands. When Dakota Access Pipeline chose this route, they did not consider our strong opposition. Our concerns were clearly articulated directly to them in a meeting on Sept. 30, 2014. We have released that audio recording from our council meeting where DAPL and the ND Public Service Commission came to us with this route. “We ask that the United States stop the pipeline and move it outside our treaty lands. Consideration must be given to what might occur when the Army Corps — likely backed by the National Guard and multiple heavily-militarized law enforcement agencies — moves to physically clear the encampments. Water protectors have an established policy of nonviolence, to which they strictly adhere and expect all supporters to follow, but to evict that many people who have dedicated their lives to stopping pipeline construction — and who have announced they would be willing to die in order to do so — will be quite the confrontation. None of the details for how the Army Corps plans to effect this mass eviction were evident in the brief letter — but to imagine water protectors willingly giving up their massive campaign against Dakota Access and just pick up and move to a designated area is laughable at best. On December 5, the whole world will be watching to see how the U.S. government handles itself in an action directly affecting Indigenous peoples whose only goal is to protect the water from contamination — because that track record isn’t exactly good.